‘Tis the season for holiday celebrations and parties–whether they are in the classroom or with the family. What to do that is age appropriate for children and doesn’t involve sweet treats or a screen? The following active play ideas can be done indoors or outdoors depending on the space available and the weather. It’s time to begin the festivities and liven up the party! Wrapping Paper Breakthrough. 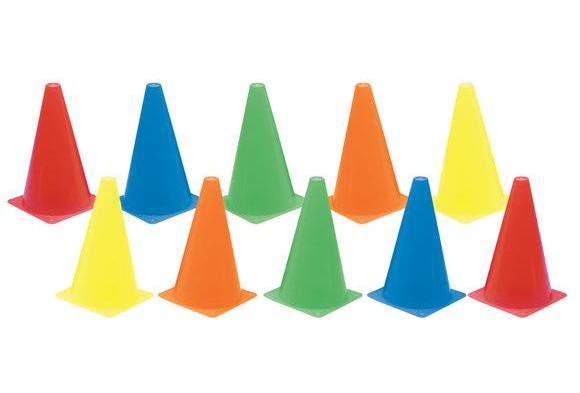 Set up boundaries using Cones or Hop Around Steps 15 to 24 feet apart. Two adults at the “finish line” hold a sheet of wrapping paper (~ 22” x 24”) with each hand on a corner. When you say, “Get ready, get set, run,” the child at the “start line” (with the palms of his hands touching and pointing forward) runs and breaks through the wrapping paper! Reindeer Pull. Distribute a Jump Rope to a pair of children. The two children are hitched together by one child placing the rope around the waist of his partner who is a Reindeer (i.e., “Rudolph”) and the other child is “Santa” holding onto the rope ends or handles. When “Santa” gives the signal “Giddy up” the Reindeer, “Rudolph” is to gallop, moving forward. Add some fun holiday music, such as “Rudolph the Red-Nosed Reindeer or “Santa Claus is Coming to Town” When the music stops, have the children switch places, taking turns being “Rudolph” and “Santa.” This is a favorite activity as children go prancing around! Snowball Throw. Give each child two pieces of white 8 1/2-by-11 inch scrap paper or 9-by-12 inch inexpensive easel paper. 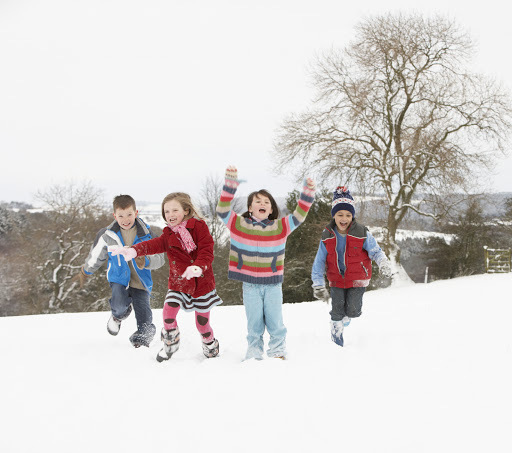 Have them wad each piece of paper up and make two “snowballs.” Divide the game playing area in half by placing a jump rope or clothesline on the ground. Divide the children into equal numbers and place them facing each other on opposite sides of the rope. Have the guests drop their snowballs onto the ground. Tell them to pick up their snowballs (one at a time) and throw them across the rope to the opposite side when the music starts. (I like to play the song “The Heat Is On”). Now we have a good old-fashioned Snowball Throw going on! The Snowball Throw is over when the music ends. For instant cleanup, have the children try to make a basket as they toss their snowball into a waste basket or brown paper grocer bag. Holiday Musical Balloons. Give each child an inflated balloon. Christmas Colors: Red and Green. Hanukkah colors: Blue and White. Kwanzaa Colors: Black, Red and Green. I like to use 9” or 11” balloons that are of helium quality, as they are “thicker skinned” and do not pop as easily. Let each child write (help if needed) their name on the balloon with a permanent marker. Have children sit down in the open space. Instruct them to stand up and keep the balloon in the air using their hands when they hear music (play rockin’ holiday tunes). When the music stops they are to grab their balloon and sit down immediately. The game continues with the children “keeping” their balloons in the air when the music is playing and holding their balloon and sitting down when the music stops. Provide further physical challenges by asking the children to keep the balloons in the air with different body parts: one finger, an elbow, a knee, a foot, their head. Be creative! Indoor Ice Skating. Attach paper plates to the bottom of children’s shoes with big rubber bands or by wrapping masking tape around the shoe and plate. The children are now ready to skate away. This technique works great on carpet. For hardwood or tile floors, simply wear a thick pair of wool socks. Add some music (i.e., “The Skater’s Waltz”) and play freeze skating. When the music is playing, “All Skate.” When the music stops, children freeze in place. And all our friends are with us. The child walking around with the jingle bell rings it and then drops it behind one of the children sitting there. That player picks up the bell and runs after “It,” who is running around the circle back to his place in the circle. The player holding the jingle bell is now “It” and walks around the outside of the circle, dropping the jingle bell behind someone who has not yet had a turn. The game ends when every player has had a chance to ring and drop the bell. Scrambled Eggs and Icebergs. Tell the kids that when they hear the words “scrambled eggs,” they are to jog around in the open space without bumping into each other. When they hear the word, “icebergs,” they are to freeze in place without falling down. Tell them you’ll also give them other movement commands, such as “jump,” “march,” “tiptoe,” etc. When they hear the new command, they must switch to the new movement. Try to trick them by repeating a command twice in a row! A ball is round and invites play with a partner or a group of friends. Let’s go outside, and play an active game that combines kicking a ball, as in soccer, and running around bases, as in baseball. No wonder kickball is sometimes called soccer-baseball. There are no outs or fouls in this preschool friendly game, just a lot of kicking and running. 1. Gather children and have them watch and listen as directions of how to play are demonstrated. 2. An adult/play leader places the ball on home plate. 3. One child stands or approaches and kicks the ball as hard as he/she can. 5. The “kicker” runs around the bases and returns to home plate. 7. Every child is a winner when they cross home plate! Be assured that they will want to kick the ball and run the bases again and again. This is play with a purpose and promotes coordination and lots of vigorous physical activity! 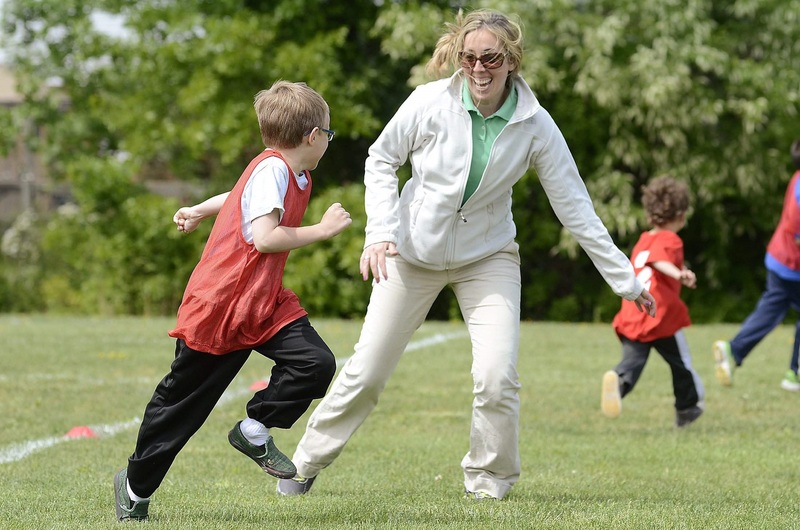 • As children become more skillful, the adult/play leader can roll the ball to the child at home plate and the child stands and kicks the ball that is rolled at them.